This was the title of my final year project for my BEng (Mechatroics) degree at the University of Stellenbosch. It’s been a year, a loooong year, but at the same time it’s passed so quickly. I’ve probably spent more time on varsity work this year than in any other previous year, a combination of this skripsie, mechatronics and electrical design projects, interspersed between the year’s class requirements. You can see a summary poster of the project here. And the full report here. Skripsie is something very different to what we’ve done previously. We’re given a year to complete the project, which is a fairly long time. What I’ve appreciated is the fact that it’s the only major project we’ve been given to do individually. It’s not that I don’t like other people, it’s just that it’s sometimes nice to be able to do things my way. Most of the projects are put forth by lecturers, and they act as supervisors for the projects. I’ve been very fortunate with my supervisor and his continued support and enthusiasm for my project. So what is it? Well it’s basically a turret that is capable of continuous rotation. 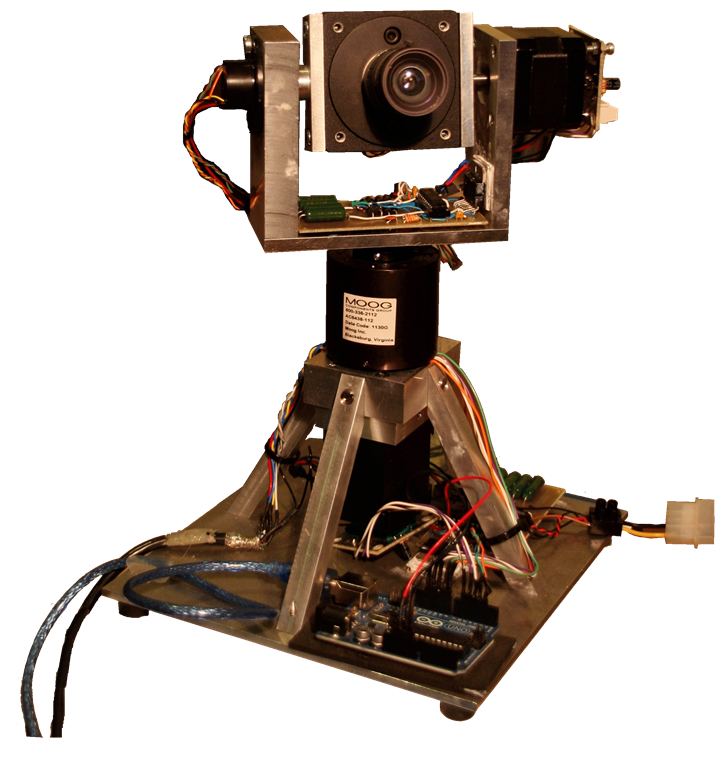 You get a bunch of pan/tilt cameras on the market, but they all stop after 360textdegree or less. The department I did my project with had purchased several Basler a311fc cameras to play with and desired a platform they could use for tracking. It’s a very nice camera, good quality and capable of fairly high capture rates (50fps @ 640×480, 132fps @ 320×240) and comes with some nifty software (Basler Pylon Driver) to control it. So the major issue was to transfer data and power to the camera. I looked at a couple of wireless solutions but for simplicities sake eventually went with slip rings. Picked up 2 slip rings (at quite a cost, well I was surprised at the expense) from Moog. Next issue was control. My control systems has never been the strongest, so decided to stick with some open loop control in the form of stepper motors. Picked up a 220Nmm and 440Nmm stepper motor to control the tilt and pan respectively. They’re bi-polar hybrid stepper motors with a 0.9textdegree step size. I drove them both in half-step mode effectively giving me 0.45textdegree accuracy. To drive them I made use of a combination of L297 and L298 ICs from ST. The idea was to be able to control this all from a PC, so some software development and integration was also required. To bring it all together I made use of an Arduino Uno. 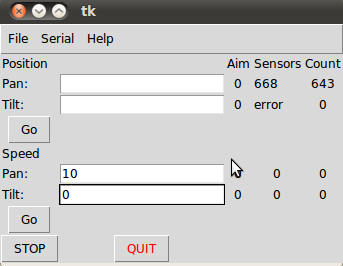 I developed a GUI in Python which then communicated via a serial connection with the Arduino. I was originally going to use Java for this, but couldn’t get a serial connection running. Chatted to some friends who suggested Python and found this post with a nice example. For testing I also got hold of two AS5040 hall effect sensors from Austria Microsystems. These rotary encoders give a 1024bit resolution, effectively 0.35/textdegree. I managed to find some nice code for the Arduino to read the data via SSI over at RepRap. 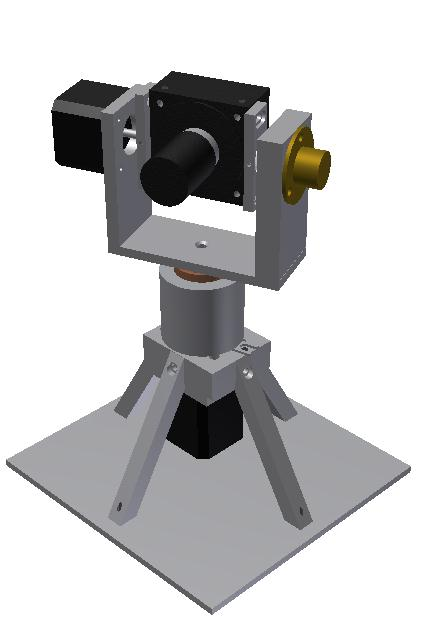 This was also the first time I’ve had the opportunity to develop CAD models of something and have it built. We’ve done several machine design projects over the years, but they’ve all been conceptual only. I didn’t machine the stuff myself, but it was pretty cool when I built the thing, and compared it to my model, and it looked the same. So I handed in the final report on the project today. Unfortunately it’s not working 100% at the moment, and one of the motor driver circuits got damaged, so I need to repair that before my presentation in a few weeks time. This entry was posted in computer, electronics and tagged arduino, as5040, basler, Mechatronics, python, serial, skripsie, stepper motor, turret by Gareth. Bookmark the permalink. So is it avisable to register mechatronics at TUT?? What do you mean by is it advisable? They offer both a NDip and BTech degree in Mechatronics that is recognised by ECSA. I don’t know the course personally, but I’m sure it’s a decent course. Is it difficult to get into stellenbosch university with an N4, in maths and science. Or do you need a matric. What sort of opportunities do you get when you finish your BEng. International opportunities. A Matric Exemption is equivalent to an NQF level 4. You should be able to get into a university with a NQF level 4, however how easy it is I’m not sure. It’s best to contact the university’s admissions office themselves. I am aiming to do mechatronics next year . I completed my grade 12 last year in maths and science , and again am currently doing electrical engineering N4 . Does this give me a better chance? Hi Ntsodi, if you do well in your N4 this year, it will definitely help you get into a Mechatronics course next year. Thanks for the clarity . Hi I’m shasha I’mcurently my masters at nmmu in mechatronics I want to do a PhD at tuks(UP) bt they do not offer mechatronics will they allow me to do a PhD in mechanical or electrical? I don’t know the details, most engineers in SA end up with a PhD in Engineering.